"Long-term unemployment imposes severe economic hardships on the unemployed and their families, and, by leading to an erosion of skills of those without work, it both impairs their lifetime employment prospects and reduces the productive potential of our economy as a whole." One of the recurring topics of JG debate is "what would all these people do?" Some commenters have a variety of constructive answers to this question, while others suggest than any job tasks chosen by the government (even local government, as opposed to Congress) would be a "boondoggle." I am not familiar enough with the academic research and modeling to weigh in with strongly held opinions for or against the JG concept in general (though I lean strongly toward giving it the benefit of the doubt), but this post will outline a concrete JG idea I have not seen described elsewhere. There are aspects of the idea I find highly compelling, but I expect some people may hate it. Land fills consume finite land (for which available locations are diminishing), and can be unpleasant and costly to administer. Garbage incineration contributes to air pollution that adversely effects health, and consumes many materials that might have had better forms of reuse. The economy's raw material input requirements are larger than would be necessary if we reused more of our waste stream. In addition, the methods we use to extract new raw materials typically have large external costs as well (e.g., habitat destruction and pollution from mining). These external costs go down when we reuse more materials. What if the role of job guarantee work was to "intercept" the not-currently-recycled part of the waste stream with the goal of reclaiming recyclable, reusable, and organic (compostable or biofuel-ready) materials to the maximum extent possible? Source separation (such as separate curbside bins) should certainly still be encouraged wherever possible to create pre-separated streams of recyclables, organic waste (yard and food scraps), and general trash, however many localities don't do any separation at all, and even general trash streams will inevitably contain recoverable waste. So a JG zero-waste program would focus specifically on reducing the waste streams that are currently going to landfills or incinerators. 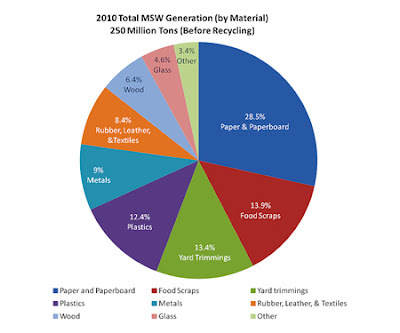 The pie chart below shows the composition of the 250 million ton annual waste stream in the US, of which only 34% is currently recycled! (Source: EPA). That 66% currently going to landfills and incinerators contains extraordinary amounts of valuable material! Separating it further would be labor intensive work, and would probably not be profitable for individual companies extracting only the materials they could sell for more than the cost of labor. But, the job guarantee concept isn't intended to be "profitable" in such a narrowly focused sense! Of course, automation should be used in waste stream separation to the maximum extent possible, and we shouldn't abuse "cheap" labor if there are reasonable automation options available! Single-stream recycling facilities already have impressive technology for separation of material types, and technologies for processing "dirty" trash streams appear to be advancing too! But based on my limited knowledge, even these advanced "dirty" processing facilities still require some human labor in the sorting process, and may also be too expensive for many municipalities. We are probably still decades away (I'm guessing!) from sophisticated enough computer vision and robotic dexterity to achieve everything a human can in this type of process. Job guarantee workers would be providing an obvious-to-all public service with broadly shared benefits, because the waste stream is produced by just about everyone, and the negative externalities being reduced would otherwise be suffered widely also. With other JG roles sometimes suggested by commenters (reading to the elderly, planting trees in parks, removing graffiti, etc) there might be concerns by voters about jobs benefiting some demographics more than others, or about potentially poor choices of projects in general. But everyone benefits from a zero material waste economy! If a program of this type intercepted the part of the waste stream not already being reclaimed, it would not compete with the private sector or charities (or perhaps very minimally). Presumably this work is too labor intensive to be cost effective for private industry, but cost effectiveness (with the typical narrow definition of a single entity's cash flow) is not the goal of the job guarantee. It is inherently local (which is one of the MMT design choices for implementing a JG), because waste streams are produced everywhere people live and work! The financial costs of waste handling are often already paid for by municipalities (source). 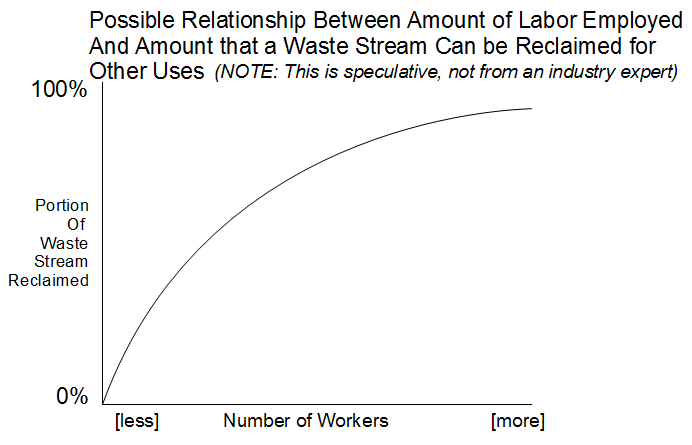 The savings in materials-flow-related external costs alone (pollution, landfill space, and raw material inputs to the economy) could significantly offset the program's "costs" in terms of wages paid to JG workers (not that a JG program should be required to be provably "profitable" to be considered a success). After also accounting for the benefits to society of reduced involuntary unemployment (e.g., reductions in mental illness, crime, family breakdown, soup kitchen spending, safety net transfer payments, etc) such a program would look even more cost effective! It would scale easily with the ever-changing size of the JG's buffer pool of workers. If the economy booms and the JG pool shrinks and there is no fiscal adjustment made by federal government to increase the pool (potentially needed if inflation were accelerating), then more of the waste stream will simply end up in the landfill or incinerator as is the practice today. Thus "zero" waste would be an exaggeration, but the waste reduction might still be large. 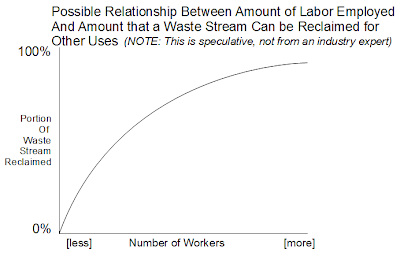 Conversely, if the economy contracted and the JG pool of workers grew large, perhaps the sorting process could focus on reclaiming a much larger percentage of the waste stream, possibly even with extra time to break down and disassemble complex waste into component parts. What would the "typical" size of the JG pool of workers be? At least one MMT economist has suggested it might average around 3% of the work force. Waste sorting and separation jobs would be easily filled by unskilled labor, consistent with the "hiring off the bottom" goal of the JG. A job guarantee is widely recognized as setting a floor on economy-wide wages. However, it might also set a floor on conditions. Some commenters have expressed concern that having too many jobs viewed as "easy" in a JG (reading, tutoring, etc?) could be a problematic competitive force attracting workers from private sector jobs to the JG. An assumption in this thinking is that society relies on some industries in which the work can't be made "fun" and "easy" and while there should certainly be safe and humanitarian working conditions enforced, those industries' attempts to pay enough to retain workers might result in problematically large shifts in private sector wage structures, potentially raising the general price level by enough to force the nominal JG wage too far below a "living wage" to be politically acceptable. Thus, for better or worse, waste stream handling as a choice of JG program would be likely be seen by voters as not setting an overly "cushy" floor for work conditions. Waste handling is a large enough problem that it might (?) be able to absorb ALL JG workers (even if that represents 3% or more of the work force). Waste handling is a national and global problem so best practices could be shared widely across implementations. Such a program might be able to piggy-back on some existing infrastructure. Such a program might not be seen by voters as "make work" (see CETA-related quote here), and thus have higher political feasibility than some JG suggestions? Such a program might not be "transitional" enough -- does it adequately prepare workers for transition to the private sector when a job becomes available? I don't know, and I'm not sure how favorably it would compare in this respect to other job types suggested for unskilled labor in JG programs. Could the potential for unsanitary organic waste (dirty diapers! ), sharp metal or glass, hazardous chemicals, etc make it too dangerous? Are there standards for hazmat suits and assistive tools and technology that would suffice? Even assuming so, there would need to be some sort of externally administered inspection process to ensure safe working conditions. Could such work inherently lead to repetitive stress injuries? I'm not sure how highly repetitive such sorting tasks would be given the nature of a mixed waste stream -- it could include some interesting dis-assembly of a big variety of items (toys, electronics, furniture, etc) into their component pieces. Perhaps every certain number of hours would involve a shift in the "creative project" room designing and building the [mini-]pyramids for the 21st century and other art out of the waste not useable for other applications! Separability of materials might be too difficult if organic waste can cause too much contamination... but this might be addressed with larger source separation initiatives (curbside food and garden waste containers) along with a willingness to send unrecoverable bags or clumps of trash to the landfill-bound conveyer. Energy use for sorting, transportation, and reuse might be more of a limiting factor than the needed human labor. If getting the separated materials back into the industrial production stream in a useable form required too much energy, such a project might not be popular (at least until further strides are made in renewable energy). Of course, the organic waste stream may itself be an energy source given ongoing innovations in waste-to-energy technology. Some new infrastructure (facilities and equipment) might be required. This could actually be beneficial to the economy if there was enough spare economic capacity to build and produce what was required within putting undesirable upward pressure on prices. Aside from the drawbacks above and whatever else I've overlooked or gotten wrong, this almost seems too good to be true! What do you think? To repeat, the high level aspiration outlined here is to "kill two birds with one stone" by matching the goal of reducing human labor waste (involuntary unemployment) with the goal of reducing other external costs currently borne by society. This post focused on the "other external costs" related to materials flow and associated environmental sustainability, but are there other large-scale external costs a JG could potentially address? The program sounds like it shares a number of characteristics with the Job Guarantee as proposed by primary MMT authors, and it's more recent than the Great Depression work programs that people often mention in comments. So, what did it do right? What did it do wrong? What are the lessons learned? Why is it not being used as an example in these discussions, or mentioned by primary MMT authors? (Perhaps it has been and I've just missed it). Was it successful for its size (despite not being an unlimited offer of work positions at the policy wage, as proposed under a JG) but just not big enough to matter? Were there major unintended consequences that weren't addressed? Was it ultimately sabotaged on ideological grounds by free market fundamentalists? Did the voters and the unions reject it on the grounds quoted above? Anyone know or have useful links that I've overlooked? 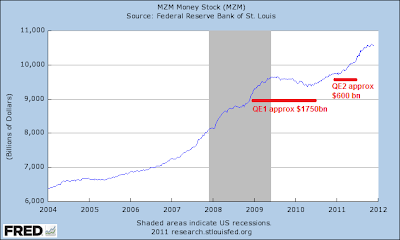 Some of my posts starting in October 2010 (the most recent one is here, with some conceptual graphics) have focused on the endogeneity of the money supply independent from the broad Post-Keynesian observation that loans create deposits. That is, the dynamism of the economy (largely courtesy of the financial sector) seemingly allows households and businesses on aggregate to self-determine their portfolio composition -- i.e., how much "money" they hold -- independent of both government policy and private debt levels. 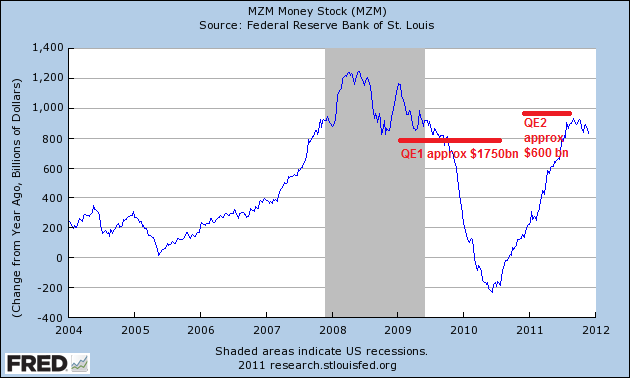 Money supply did not grow as much as the QE operations alone would suggest. The actual trends are very volatile (probably having to do with uncertainty and liquidity preference during recession and expanding financial assets in line with a growing economy during economic growth) and so it's difficult to say anything conclusive other than that QE did not provide a 1-to-1 increase or obviously "shift" the trend lines while active. "As it is, a highly developed banking system already provides such facilities on an ample scale, since it is prepared to accommodate the public’s changing demand between different types or financial assets by altering the composition of the banks’ assets or liabilities in a reverse direction. If the non-banking public wishes to switch its holding of gilts for interest-bearing bank deposits, the banks are ready to supply such deposits at the minimum of inconvenience, and at the same time to place their surplus funds into the gilts which were previously held by the public. Similarly the banks provide easy facilities to their customers for switching balances on current accounts into interest-bearing deposit accounts, or vice versa. Hence, while the annual increment in the total holding of financial assets of the private sector (considered as a whole) is nothing more than the mirror-image of the borrowing requirement of the public sector (in a closed economy at any rate), neither the Government nor the banks can determine how much of this increment will be held in the form of cash (meaning notes and current deposits) and how much in the near-equivalents to cash (such as interest-bearing demand deposits) or in various forms of public sector debt. Thus neither the Government nor the central bank can control how much or the total financial assets the public prefers to hold in the form of ‘money’ on one particular definition or another." Kaldor certainly appears to have these concepts mastered (including financial sectoral balances) and this was 1982! It's amazing to me that virtually none of this could "rub off" onto the economics mainstream over a period of three decades! Ramanan quotes more interesting details from Kaldor in a second post (follow the link to read it). I'm not sure whether I'm odd to find this stuff fascinating or whether my descriptions are not clear and/or don't seem credible (and I admit I still may have some things wrong!). It may just be that this is clearly less important than topics on "fixing" the economy's current primary problems. But I've considered putting together a mini step-by-step visualization on EconViz on this topic (when I can get to it) -- if anyone would find this beneficial in clarifying these interactions, please say so. 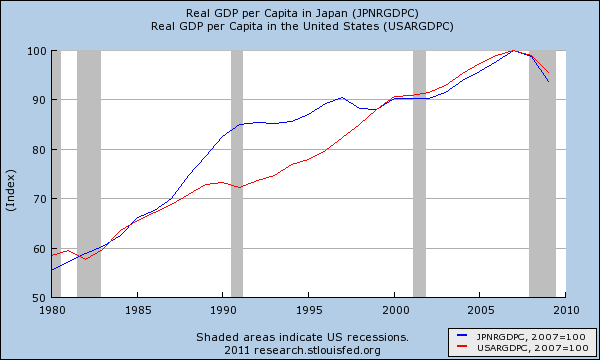 The US Becoming Japan... not in the way you may think! It has become common in recent years to suggest that the US is headed the way of Japan, with the implication being that Japan has been an economic failure in recent decades. (I starting expecting in the early 2000s that the US would follow Japan, also, but for some right and some wrong reasons). Last year and again today I've highlighted the huge degree to which Japan's economic performance is a story about demographics and the confusion about nominal versus real in the context of periodic mild deflation. So, poor economic growth could become a self-fulfilling prophecy via the demographic channel itself! "The story begins in the terrible winter of 1945-6, when, newly bereft of their empire, the Japanese nearly starved to death. With overseas expansion no longer an option, Japanese leaders determined as a top priority to cut the birthrate. Thereafter a culture of small families set in that has continued to the present day." "Japan’s motivation is clear: food security. With only about one-third as much arable land per capita as China, Japan has long been the world’s largest net food importer. While the birth control policy is the primary cause of Japan’s aging demographics, the phenomenon also reflects improved health care and an increase of more than 20 years in life expectancy since 1950." 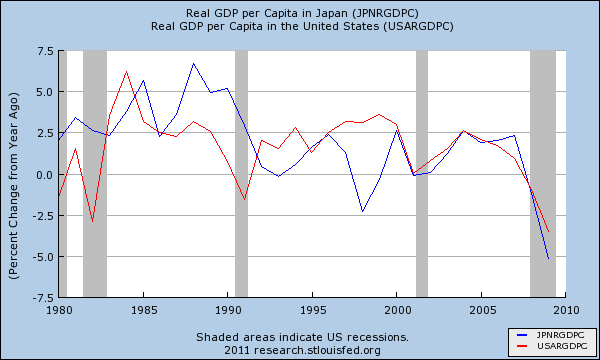 Nevertheless, if US policy makers were to sabotage the US economy further by actively imposing austerity, we might yet follow in Japan's economic path (or worse) but in a different way than typically suggested! I should also note that I'm not suggesting that higher population growth rates are inherently better, just that they contribute to economic growth (for better or worse). I recognize the planet's finite resources are being strained, but I am also a mild optimistic regarding our ability to accelerate "radical resource productivity" with the right fixes to the political system and the current massive problems of externalized costs. Noahpinion may have read my previous post because he or she used my first graph above without changing the file name I had chosen. I won't discuss all these posts in detail and there are points in each I disagree with. 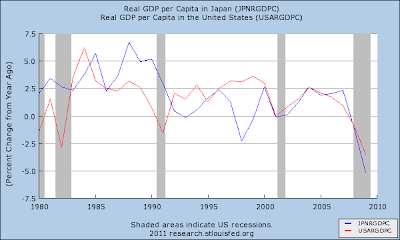 "This picture suggests that the Japanese economy was indeed depressed for about 16 years, and deeply so after the slump of the late 1990s. But it may have returned to more or less potential output on the eve of the current crisis." 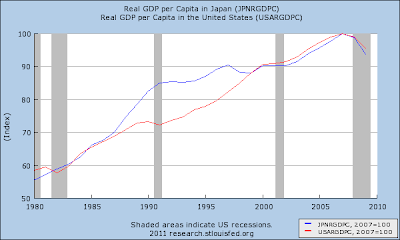 Look at my second graph (above) and you can see the extraordinary growth in the late 1980s in Japan. Was this growth "above potential"? Was Japan somehow borrowing from the future in the 1980s, and are the Austrians correct that slower growth in the 1990s to undo the "excesses" and get back to the trend line must be an inevitable outcome? (I do think the answer is closer to "no" than "yes", but don't have all the answers for how/why). I believe MMT shows how the "hangover" theory of economic growth is wrong (as opposed to asset prices, which MMTers generally agree must be allowed to adjust after bubbles pop). This is because it is always possible for the flow of national income to be sustained by government deficits or net exports even if the leakage to private sector savings increases. Perhaps there was a massive inventory effect from overbuilding of real estate in the 1980s, requiring less building in the 1990s. 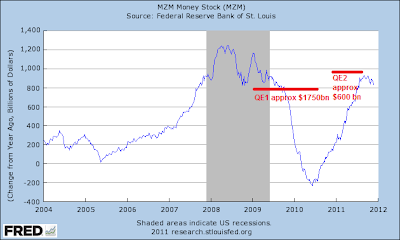 Should that or other dynamics have pushed unemployment so low as to cause accelerating inflation? Glancing at some graphs it appears Japan's late 1980s unemployment got down to around 2%, with inflation rising to around 4%. What would have happened if the economy hadn't slowed after 1990? 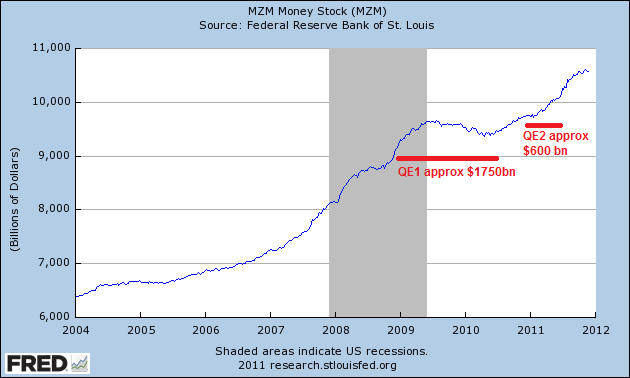 Would inflation have accelerated upwards uncontrollably? It doesn't seem obvious that it would, but I don't know the answers. If not an "overbuilding" dynamic or a labor force participation dynamic (not yet investigated), then perhaps the majority of the late 1980s surge can be explained by a huge above-trend rise in productivity. If so, is there any implication that productivity will inevitably grow below trend after such a surge? It doesn't seem like such a reversion should be inevitable, but perhaps there are dynamics specific to the types of productivity improvements in Japan in that time frame that would provide more answers. Comments and insight are welcome. I'll split a few more observations on demographics into a separate post to keep this from getting too long.